There are two things I’ve got against displays of cut flowers. But there’s my second point: why not keep them growing? Have I mentioned my basil plant? I call him Basil. I’ve carefully tended Basil from a limp, shop-bought state into a riot of greenery spilling over the kitchen window sill. Same with flowers. Why miss the fun? Then again, if the garden’s rioting and you just have to trim it back a little, it’s a waste to throw away cut flowers when they look so nice arranged in a sunny corner. You’ve already seen the photo heading this post. 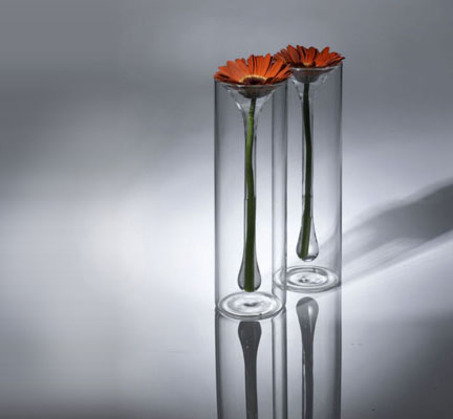 It’s the brilliant work of Yee-Ling Wan and Steve Jones, and although I’ve seen a few single-flower vases before, this beats them by a long way. The flower rests in an inner teardrop of glass, drawing attention to the simple, effortless beauty of one flower – just one. I think I’m starting to like flowers again.